Not a real company, just some pre-recorded videos. I purchase this course in groupon for $30, so I suppose there is not much to expect. Pure scam! Don't lose you money and time guys! These guys won't teach you something useful. They give you only one indicator that's very hard or not possible to trade with. 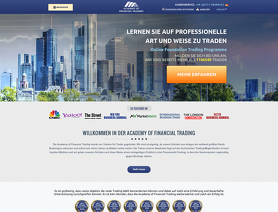 AcademyFT Ultimate Trading Program is a scam! AcademyFT has recorded videos that they sell via GROUPON for $9. When they get you interested, you will have to BUY entry for Ultimate Trading Program and troubles starts. No access to any resources! No contact from anyone from AcademyFT. When I call support line it is always redirecting to voicemail. Many emails have been not responded. Don't waste your money and avoid AcademyFT UTP!!! Last Fall, my brother sent me an email asking for my opinion on some BioTech companies he was investing and trading. (Along with my nephew). My background is in healthcare and research, however I'm no longer able to work in my field because of my own health issues these days-in fact I'm basically house-bound. Researching these companies peaked my interest enough in the markets, and I began competing against my Son (my kids are all grown) in a commercial app-basically paper-trading; and that was "IT", I LOVED it, and in my typical ADD hyper-focus fashion, I began reading everything I could get my eyes on! I also began to realize exactly how much I DIDN'T know. Around Dec, a friend recommended I check-out this "deal" for a course advertised "On Sale" for $5 on a website listing many different kinds of "educational opportunities" and certifications. It was this course and was to begin Jan 4. In the meantime, I watched videos, read, even devised a mind-map of terminology and concepts used in trading and investing-but things just weren't "clicking". I need to confess: I'm a learning addict and perpetual student--if I'm not learning something new from a book, TV show, website; I drop it. I had more certifications and a few degrees before age 25 than most people attain in a lifetime. At this point in my life I've been dealing with depression because for over 30 years I was working usually more than one job plus going to classes for something or another. Not having the money I became used to, I can deal with. Not having a PURPOSE, a GOAL, a Future? Not so much. I was very excited about starting this course! When Jan 4th arrived, I gathered my new notebook I'd purchased and settled into the familiar feeling of starting a new class. And I wasn't disappointed! Was it the BEST course for learning the fundamentals of trading? Probably not, BUT, it was exactly what *I* needed at exactly the right time. I tuned into the webinar for the first of 10 "classes"; 9 of them were "Live" classes where my Irish Instructor, Tom Daly, encouraged questions and participation; one was an "On Demand" class. The webinar classes were on Mondays and Wednesday's at 2PM and we were assigned a liaison who would call and/or email in between classes asking if we had any questions, (he was also in Dublin, Ireland). It wasn't until our 7th class that we were assigned a Demo account through a broker who is associated with the "academy". I want to emphasize though, that at NO TIME during this fundamentals course was this broker ever suggested or recommended. (I believe it's called PipIndex, but need to confirm). The platform we used was MetaTrader 4 and this was my first exposure to the wonderful world of FOREX. Although we touched on all the different instruments used in trading and investing; it was FOREX that really lit a spark, primarily because I couldn't understand it at first. And I LOVE a challenge!! As far as the rest of the course content, it touched on Fundamental Analysis, went into more detail in Technical Analysis and the last 3 classes were focused on Risk Management. They call their primary strategy "counter-retail-trader", supposedly meaning that they trade more in the vein of "Market Makers". After doing further research and speaking with actual "retail traders" since the course ended; I believe that this particular concept is the weakest detail of the course. However, when you take the whole course into consideration, this is just a slight distraction from the rest of the content. The only other thing worth mentioning was that towards the end of the course, about the end of lesson 8; they DO start pushing their more advanced course, The Ultimate Traders Package. I have to admit, if I had an extra $400 right now, I would have purchased the course. It entails not only another 2 months of courses, but a lifetime membership to their ongoing weekly updates as well as a lifetime membership to Shaw Academy-which offers courses in programming, graphics, project management, office skills, and many other assorted courses. I just won't be in a position to afford much for a couple of months. Bottom line: for Absolute Beginners? It's almost perfect! For traders with any experience? The Fundamentals course isn't worth your time-OR the $200-$350 they normally charge for it. The UTP? THAT may be worth your time and money-especially with the personal attention these folks afford their students. After investigating about 10+ other "courses" on the net-many of them either directly or indirectly associated with one of these "Gurus", (and making the mistake of giving out my email and number to a couple-resulting in literally hundreds of unwanted emails each day, unresponsive "unsubscribe" options and several phone calls daily); MY opinion is that the UTP offers a much more realistic and less commercial program....Not to mention, it's also a lifetime of learning-if you so choose. To be quite fair - I was very skeptical when I found this company via Groupon, especially when the price was so cheap. However this being said the course itself was fantastic. I've dabbled in online trading before but the information provided was very straight forward and concise compared to other courses I've looked at. Opportunities were provided after each session for questions, so 'students' like myself always remained informed throughout. A few elements could be improved such as maybe 1-1 time, but overall, fully worth what I paid!